Fighting online scams is a 24/7 job, and we couldn’t hope to do it without the help of our custom Scamadviser algorithm. What the heck is an algorithm I hear you say? Well an algorithm is simply a set of rules and indicators that our search engines follows and checks on any website you type into our handy search bar. This enables us to give you a simple and easy to understand the Trust Score (as a percentage) within seconds. Ok so I understand what it is… but how does it work? Well that’s what we hope to explain on this page. However, we can’t reveal everything about the ‘secret sauce’ that goes into Scamadviser (otherwise the scam sites would know too!). But we hope it gives you enough of an idea of how that magic number is generated when you hit enter. The core principle of our Trust Score is positive and negative indicators. Certain factors will increase a website’s score, whilst others will decrease it. Once all the relevant factors have been checked, up pops the final Trust Score! The popularity of a website can be a key indicator of how reliable it is. If a website has a lot of visitors, it can often mean that it has engaging and credible information/products/services to offer to users. A scam website that is very new, has terrible presentation or is full of harmful ads will fall down this ranking as users will not be going there very often. Websites know that they can live and die based on their social media engagement. Most businesses recognise that this cheap and global communication channel is vital in the success of their business. So, they tend to be on their social media accounts a lot, pushing their products and offers, responding to consumers and creating buzz. Scam websites are often not to bothered by this, as it takes effort and resources to push this kind of service. Therefore the Scamadviser Trust Score can check if a site has active social media accounts, and will adjust the score accordingly. Consumers want to voice their opinions on great websites. Whether its great service, great prices or exclusive deals consumers want to reward a great experience with a great review. So it’s a no-brainer for Scamadviser to use this source of consumer knowledge in out Trust Score. If consumers are happy with a website we’ll be sure to take this into account when calculating our Trust Score! The speed and technical proficiency of a website is crucial for many reasons. First of all, website owners want their website to be as slick as possible for their users. This also has an effect on the google ranking of a website. The priorities for scammers often differ. Their time and effort Is spent in directing users to their sites through spam, fake advertisements and malware. Therefore they can have sloppy, inefficient websites. Well our score takes this into account and will reduce the score based on poor performance in this area. Noticed that little green padlock on the address bar? Well that means that the website has HTTPS (Hypertext Transfer Protocol Secure) and therefore there is an added layer of security when you and the website are communicating with each other over the internet. There are other technical methods a website can use to add security to your browsing experience. But these often cost time, resources and will be checked by a third-party…. All things scammers don’t want to happen. The Trust Score peek into the security of a website and verifies the level of security, reducing the score depending on what it finds! This is often a highly debated point when it comes to our Trust Score rating. When it comes to certain scam activities, there are patterns related to the geographical location of that particular website. This does not mean that we blindly reduce the Trust Score of sites from this particular country. We will take multiple factors into account when the algorithm evaluates whether the website is suspect and if to reduce the Trust Score. Website creators will often have to note down certain details about themselves when creating a website. However there are methods to disguise the identity of the owner(s). This could be for perfectly legitimate reasons, but is also performed by scammers trying to evade being caught. Genuine ecommerce businesses usuallyhave nothing to hide and do not hide their company data from the registration. Therefore we take this indicator into account along with other factors to evaluate if the Trust Score should be lowered. Scammers are sneaky… and they don’t stick around for long! This is the same for their websites. Often users complain, the ISPs (Internet Service Providers) or search engines catch on etc. and those scam sites get shut down. Therefore scammers take this into account and will set up new scam sites at a rapid pace. Scamadviser’s Trust Score takes this into account and will check the relative age of a online store into account. If we can see that, alongside other indicators, a website is matching the pattern of a scam website we will reduce the Trust Score. Every website has to live somewhere, and that home is called a server. But servers often don’t have just one website on it. Often times scammers will pick hosts who do not mind more questionable content. This means that these server hosts have a lot of content that is of the less reliable kind. Our Trust Score can see the big picture, and track the scam sites that are clustered on one host. The algorithm can them reduce the score of future sites that decide to make those high-risk servers their home. 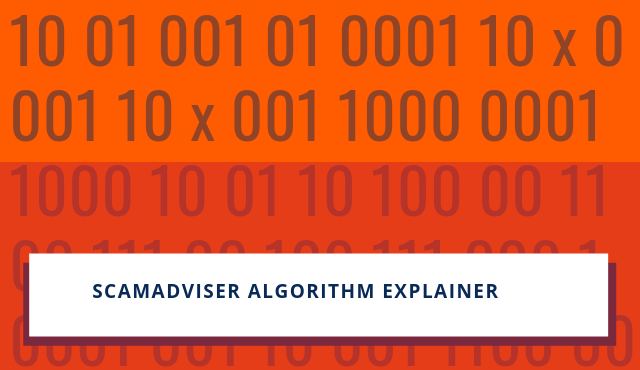 Of course our algorithm is complex and constantly evolving. These are just some of the factors that are at play when a website is assessed by our algorithm. But we can’t give everything away here, otherwise the scammers will catch on! Just be safe in the knowledge that we never just ‘sit on our hands’. As scammers adapt, so do we. All so we can protect our users. Stay safe out there Scamfighters!